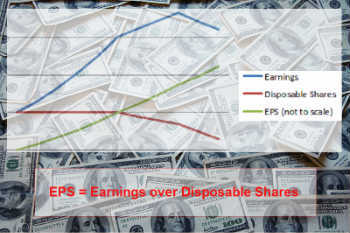 Earnings per share (EPS) is a key indicator of a shares value. It is a simple calculation: Total earnings divided by the number of shares issued. As a general rule, increases in earnings per share reflect a growth in earnings and are an indicator of a fundamentally sound business. Companies that have consistent growth in their EPS typically are rewarded by increases in their share price. Yet, EPS does not always show meaningful increase in revenue. A recent example has been IBM’s strategy of share buybacks. Over the last ten years or so IBM has focused on reducing the number of shares in play rather than on increasing earnings at required rates. This meant that EPS was showing consistent, strong growth that were not necessarily indicative of the underlying growth in revenue of the business. This is the principle reason that the recent (Q3 2014) financial miss has been slated by many analysts. Analysts are questioning IBM’s strategy which has been to inflate earnings per share by reducing the number of shares available to the market. Many analysts argue that this cash would have been better spent on investments for growth — such as R&D. They argue that share buy backs – while having a role to play in increasing investor value – are not a reflection of the company’s ability to grow earnings. A key challenge for decision makers is to understand the fundamentals of a report. 3 businesses may meet EPS growth targets of 15% per annum. Business 1 did this be increasing earnings through increased sales of core products – an indication that the company is on a sound track. Without context our results are open to interpretation. EPS is just one example of a key metric that can be interpreted in different ways. Different business units, or managers, may apply their own interpretations to various metrics – budgets, expenses, growth, profit, head count, and many more – resulted in confusing and conflicting results. Or they may source their data from different systems – creating different numbers. Results that seem fine when viewed at department level may create significant confusion when aggregated and rolled up to an enterprise view. How did we calculate EPS? Did we include exceptional earnings? What was the impact of share buybacks? Where did we source the data? What was the quality of the underlying data? Which period did we measure? Can we map results from one system to results from another? Are key metrics consistent across systems, geographies or business units? These are data governance questions that are key to supporting the data driven business. Context allows decision makers to perform their own due diligence and ensures that we are making informed decisions. Context may be captured in the form of a business data glossary, as business data lineage, and as linked between business definitions and technical metadata. Do you have context for your data? This post does not constitute financial advice. Before you consider buying, or selling, anything please do your own due diligence. Gary, excellent post, which I can’t agree more. In fact, this is one of the best argument of why Data Governance. Not because Data Governance is in charge of defining business goals and context, but it stimulates the correct thinking. However, only the better Data Governance consultants ask or demand such insight, most of them just focus on the technique of Data Governance. I liked the examples, since they brightly demonstrate the invaluable of the context.